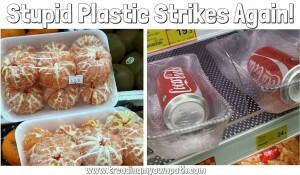 Be part of the Plastic Challenge! The Marine Conservation Society (MCS) are challenging you to give up plastic this month, with the plastic challenge! How long can you go? A day, a week or a month?? It may be harder than you think, going completely plastic free can be a real challenge with the amount of products that contain plastic and come in plastic packaging. It is possible, just have a look at Treading My Own Path for some inspiration on how to de-clutter your life and really go plastic free! Plastic takes a long, long time to go away, and doesn’t truly degrade, at best it just breaks down into smaller particles but this in itself may be even worse. Up to 20 million tons of plastic end up in the oceans every single year, sealife such as dolphins, seals, turtles and orca will eat plastic mistaking it for real food. Really nasty toxins can stick to plastics and end up being consumed by fish, thus entering it into the food chain, these fish can end up being eaten by other fish, even polar bears. But it doesn’t end there, microplastics have been found in mussels, oyster and sea scallops, you can guess where they could end up after that if you eat seafood… yep, you and me. So that plastic wrapping you chucked away from your fancy electric toothbrush ended up in the sea, was eaten marine life, passed through some fish, maybe some birds and perhaps those tasty mussels you tucked into the other night, so yep it finally can end up in you. This website certainly isn’t going to change the world but I’d like to try and make more people aware of this, plastic is a new invention (before you say it’s been around for over 100 years, yes that IS new, the Earth is 4 billion years old) yet the world is quickly filling up with it. If you don’t believe me take a look around you, you’ll see it everywhere, if you are reading this on a phone or tablet it’s in your hands now, or if you are on a computer just look at your mouse, keyboard, screen. It’s on you right now, your clothes probably contain it and will most likely have been packaged in it. Whilst it has been a very useful invention it has been too successful or it’s own good, the ability to make anything in any shape with plastic has opened up so many possibilities but it has come at a price with is only going to get worse. The problem now is nothing really compared to what it will be like in 100 years if we don’t change our ways, it’s not like we can just blast it off into space (hang on a minute, maybe… no that’s a terrible idea!). So if you’d like to help raise awareness and raise money for the Marine Conservation Society, share some ideas on how to cut your plastic usage or just read more visit MCS. This entry was posted in Blog on 8th June 2016 by Pete. Well hello and thank you for coming to Overpackaging. I’ve recently relaunched this site after building it many years ago and eventually not having the time to update it. I’d seen some pretty bad examples of wasteful packaging recently so I thought it would be getting the site back online and letting people add their pictures to name and shame poor environmentally unfriendly packaging. So the new site has a nice and easy upload page where you can pop your pictures in and leave a little description of what it is and where it came from. I’ll get in contact with the offenders if it is particularly bad and share their response on here, you have to give them a chance right? I came across this image on the Treading My Own Path Facebook page which kind of sums up what I want to see stopped with this site. Anyway I hope you enjoy the site and make sure you send your pictures in! This entry was posted in Blog on 10th August 2015 by Pete. Think of how many plastic items you use in a day, just count them up. I’m going to make an assumption here that with you being on this site and reading this you are a bit more responsible than your average Joe (or Jane) so probably use less than most. So if you think about how an average person who doesn’t really give much thought to these kind of things and it quickly becomes a bit worrying when you imagine them getting up in the morning, washing their face with microbead face wash (yep they are usually plastic and go straight down the sink), picking up a coffee with a plastic lid, getting a meal deal for lunch with a plastic sandwich container, a plastic bottle, and perhaps a third snack item in a plastic container. Then on their way home picking up a ready meal, again in a nice plastic container. That is just food, imagine if they went shopping for all sorts of other things and you quickly get a disturbing picture in your head of how much plastic waste they ‘produce’ and that’s before you even think about their working life, how much waste does this generate as well? Much of the waste that is simply discarded ends up in the oceans, we produce 20 times more plastic now than we did 50 years ago and it’s getting worse not better. Plastic that ends up in the ocean floats around for years on end, and there is A LOT of it, it’s a huge problem and very dangerous for marine life. Entanglement: This is the most obvious, we’ve all seen the terribly sad pictures of seals, dolphins, birds , turtles caught up in our mess. Entanglement like this can restrict movement or even cause suffocation. Ingestion: Marine life has been around in the seas for millions of years, plastic hasn’t. 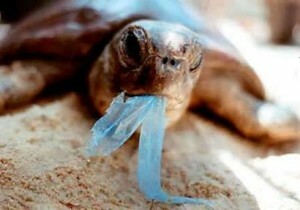 Sea Turtles, fish, seabirds and marine mammals will ingest plastic waste they mistake for food. A study in 2001 (Bugoni et al) found out of 38 green turtles 61 percent had ingested some form of marine debris from plastic bags, rope or cloth. Marine life can often ingest plastics accidentally when feeding on natural food, the plastics can build up in their stomach making them feel full, often leading to starvation when vital nutrients can’t be absorbed. Many plastic materials contain harmful toxic substances which can cause death. Ecosystem Damage: Plants and other immobile living organisms can also be affected for example coral reefs can be damaged by debris, especially fishing equipment. But these are the direct effects, once the plastic has entered the eco system into one organism it can be passed on up the food chain, even up to humans. So what can be done? Well we all know using less packaging and recycling more would stop new plastic and other rubbish going into the oceans, but realistically this is never going to prevent all new materials going into the seas (not even close). This is where a 20 year old Dutchman comes in. Boyan Slat is the founder of The Ocean Cleanup which aims to deploy a series of V–shaped floating barriers. The first of these is to be deployed in 2016 off Tsushima, an island between Japan and South Korea. The solution is not to use giant nets as has been suggested before which would inevitably trap marine life. The floating barriers use the natural movement of the ocean currents to concentrate the plastic and passively transport it to a series of collection platforms. Most of the current flows underneath the booms, taking away all (neutrally buoyant) sea life, preventing by-catch, while the lighter-than-water plastic collects in front of the floating barrier. The array of floating barriers attached to the seabed are built for large-magnitude deployment, covering millions of square kilometrers without moving at all. The project hopes to place the system in the ‘Great Pacific Garbage Patch’ between Hawaii and California that has become a collection point for marine debris. They believe the system could capture almost half of the plastic in the patch over 10 years. The Ocean Cleanup has launched a crowd funding campaign to support the project with the support of many scientists. There are some detractors however, with questions raised over capturing microplastics that are the most dominant type of debris. So this may not be the full solution but it’s hard to argue against it, maybe it can’t get everything but it’s a start, a very big and positive start. This entry was posted in Blog on 14th June 2015 by Pete.